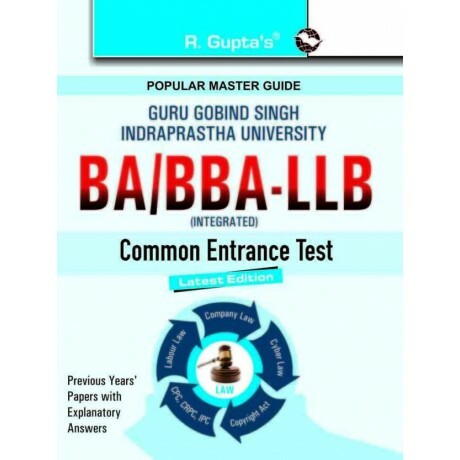 R. Gupta’s Popular Master Guide Guru Gobind Singh Indraprastha University BA/BBA-LLB (Integrated) Common Entrance Test is a comprehensive book for class 12 students aspiring for admission into the BA/BBA-LLB program at GGSIPU, Delhi. The book covers the latest syllabus of the common entrance test and gives lucid and concise explanations for the topics. It presents previous years’ solved papers with explanatory answers, helping students learn how to answer the questions. The book gives students authoritative solutions, which explain the concepts as well. In addition, it explains Labour Law, Company Law, Cyber Law, Copyright Act, CPC, CRPC, IPC and other relevant topics for the integrated course. Ramesh Publishing House has brought out many books for aspirants of civil services exams and general undergraduate exams. Other notable books are Hand Book of Electronics and Communication Engineering, ITBP-Constable/Head Constable and Indian Railways Group 'D' Recruitment Exam Guide : Popular Master Guide. DescriptionUniversal’s Guide to CLAT & LL.B. Entrance Examination is an exhaustive and easy-to-use manual on the subject of preparation for the most revered Common Law Admission Test (CLAT) as wel..